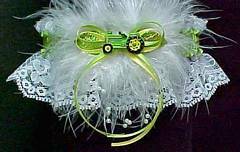 The Custom Themed Tractor Garters are trimmed with a John Deere Green Tractor or the International Red Tractor. The satin band and iridescent leaves match the tractor along with the double bow in coordinating colors. A triple loop of floating pearls adds to the Custom Theme Country Garter - Farm Garter. The Custom Themed Western Garters have a denim blue band and include your choice of a Western or Farm Charm attached to the garter. 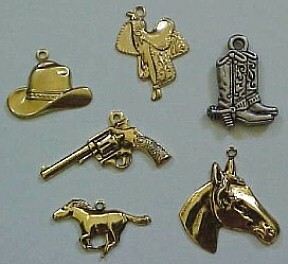 Choose from a western cowboy hat, western saddle, western cowboy boots, 6-gun, mustang horse, or a horse head. 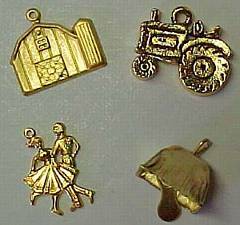 The farm charms include a barn with silo, farm tractor, square dancers, or a cowbell. A metallic bow and floating pearls finish the look. 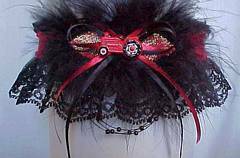 Country Garter - Farm Garters.